← Proud in heart ? “If you wish to go to Paradise, Heaven, New Jerusalem, Heavenly Zion, you must submit yourself to the authority of God, the King of Kings, Jesus Christ and do things his way, even down to the smallest matters of If you cannot submit yourself to the King in the small matter such as they are, why should he expect you to recognize your presence in any other matters? Would he fling open the gates of Paradise and fill his kingdom with rebels? Of Course not. Even Jesus Christ He knew he needed God’s Spirit to be with him if he were to accomplish the Father’s purpose in sending him to earth. He had already before this had emptied himself and was a man, powerless to do the work of God in himself (Phil. 2:7-8, John 5:19, 30). When the time came, God had an anointed servant in the earth named John the Baptist. Jesus came and submitted himself to God’s authority expressed through John and was baptized. As he came up out of the water the anointing came upon him like a dove as the Father testified from heaven, “Thou art my beloved Son, in whom I am well pleased.” Mark 1:11. One thing Jesus said was most telling: “… he hath anointed me to preach the gospel …” (Lk. 4:18). It was no wonder why Jesus hadn’t tried to preach the gospel before! Think about it! In spite of the fact that he was the virgin-born Son of God and was both knowledgeable and sincere, he still firstly lived the life of an obscure carpenter till his baptism! 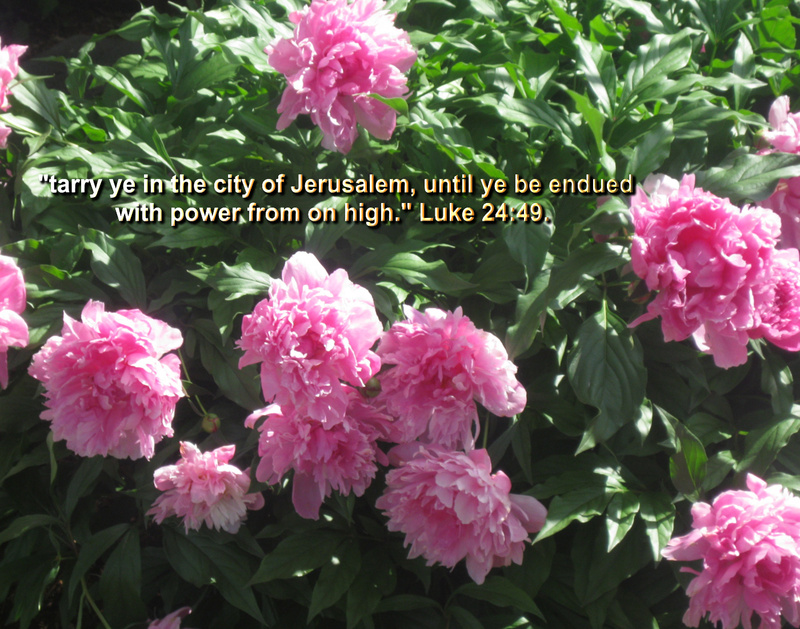 So it too was no wonder why Jesus instructed the disciples to “tarry ye in the city of Jerusalem, until ye be endued with power from on high.” Luke 24:49. Could it be that the anointing is necessary in order to preach the gospel? Hebrews 5:4 sets forth a principle of ministry: “And no man taketh this honour unto himself, but he that is called of God, as was Aaron.” Paul posed the question, “And how shall they preach, except they be sent?” Rom. 10:15. Do you suppose that being sent by a denomination is the same thing as being sent by Christ? There is a great difference between having Christ’s authority and anointing to do a thing and trying to do it without that Anointing. Yet many falsely try to do the ministry without the anointing, calling. In Acts 19 there was a chief priest among the Jews names Sceva. He had seven sons who evidently had observed Paul’s authority over evil spirits through the Name of Jesus and thought they would use his method. Before the man with the evil spirit beat them up and chased them away the spirit said to them, “Jesus I know, and Paul I know; but who are ye?” Acts 19:15. It certainly wasn’t Paul’s method that enabled him to succeed. Devils only recognize and fear those who have authority from Christ. Many evangelical groups falsely do still arise each claiming to have a special arrangement with the King to grant visas. These groups develop conflicting ideas about the Gospel even and the proper procedure for going there. Nevertheless they falsely still do and zealously plunge ahead giving out official-looking documents right and left, competing with one another for followers too. This entry was posted in Christian, Christian Life, Christianity, Relgious Christianaty and tagged Bible, Christian, Christianity, Deacons, Elders, faith, God, Holy Spirit, Jesus, Jesus Christ, Life, pastors, religion, truth. Bookmark the permalink. Pingback: Did you also know these truths? | Missing the point? Singing with grace in your hearts to the Lord. What you sow you also reap.